Missouri seemed to be caught up in the emotions of senior night Wednesday, its lackluster effort on defense allowing a flurry of 3-pointers by Iowa State that had the Tigers clawing from behind for most of the game.But when Missouri’s Steve Moore dived to corral a loose ball midway through the second half, it provided a spark the Tigers would capitalize on en route to a 78-72 victory that clinched the No. 2 seed in next week’s Big 12 tournament. Steve Moore has found ways to curiously and perhaps unconventionally wake up Missouri on several occasions this season. Lee Summit West product Michael Dixon led Missouri with 21 points, boasting an impressive field goal percentage of 80 percent. Dixon’s drive and layup gave the Tigers a two point lead with just over 3 minutes remaining, a lead they would not give up. It was Missouri’s 13th Big 12 win, the most in school history as it prepares to leave for the Southeastern Conference next season. Finishing in second place would be the Tigers’ best regular-season performance since coach Norm Stewart’s final season, 1998-99. Missouri entered the game on its first two-game losing streak of the season, including an emotional 87-86 overtime loss at No. 3 Kansas on Saturday so this was a huge gut check for the Tigers. The Cyclones are no slouch, and to come out and hold serve at home was big for this team. Big man Royce White led the Cyclones with 20 points and nine assists, as the Cyclones tallied their 6th conference loss and ninth loss overall. Iowa State continued its hot shooting from behind the arc, draining 12 3-pointers after entering the game leading the Big 12 by averaging 8.9 per game. The Cyclones hit six in the first half and led 40-36 at halftime after trailing 7-0 to start the game. After Missouri’s early lead, Buba Palo’s layup with 8:50 remaining in the first half gave the Cyclones a 22-21 lead they kept until Dixon made a half-court pass to English for an easy layup with 12:12 left in the game.Scott Christopherson had 15 points for the Cyclones, who lost for the ninth consecutive time to Missouri. The team shot only 39 percent from the field, but kept pace with the Tigers by taking 15 more shots from the field.Iowa State held a 39-28 advantage on the boards, its seventh consecutive game outrebounding an opponent. Ricardo Ratliffe added 16 points for Missouri and Pressey had four assists, giving him 183 for the season and breaking the tie with Anthony Peeler for most in a season for Missouri. The Tigers honored their eight-man senior class before the game, complete with fireworks that caused a delay early in the first half when residue needed to be mopped off the court. The class has won 103 games, most of any in school history. 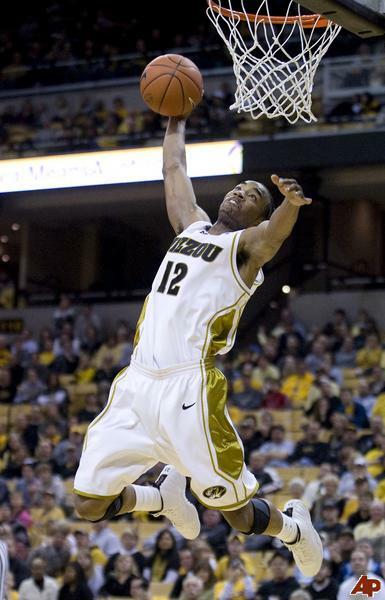 This entry was posted in Home, Midwest and tagged Marcus Denmon, Missouri Tigers, Ricardo Ratliffe, Steve Moore.